‘Reasoning of my visual path that leads towards a specific outcome‘ – that’s what my tutor recommended me to improve. He suggested more investigation and interrogation around the context through photographs and sketchbook studies. With more distant now and more contextual researches I do tackle my personal project now with a fresh mind. These still images do make it clearer that I was walking on site: sensing the environment with my full body (visual, tactile, auditory mainly) and making turns with a visual survey of the environment. At times there were points of interest (stone in the river, man-made stone sculptures) that made me move, turn in certain directions. My movement on site, looking around myself left and right, up and down, is a spatial-temporal experience. I did my walking again, now at a different time of season, spring, another smell of freshness. The idea of ‘Walking‘ as an act of embodied experience with human presence in a landscape is a subject explored by several contemporary artists. Richard Long combined his ‘Walking‘ works often with short textworks that reflects his embodied consciousness (ex. ‘Line of Ground 226 Miles Long‘). Aileen Harvey (Harvey, 2015) investigated the approach of six artists and their exploration of landscape experience. A survey of landscape by the naked eye (Irene Kapelman, ‘Untitled‘ in her book ‘50 Metres Distance or More‘). Another aspect that I can relate to is the notion of picking up traces, on my walk picking up mud and/or other particles. Gabriel Orozco was pushing this further with a plasticine ball of his body weight that he moved through the streets of the city and picking dirt and debris from the streets (‘Yielding Stone‘, 1992) . Other artists as Francis Alÿs (‘Knots‘, 2005) or Helen Mirra (‘gehend (Field Recordings 1-3)’, 2010) applying an indexing their walks i.e. they mark places on their walk either with knots on a string (Alÿs) or by making ink imprints of found objects in a certain (Mirra). Alÿs works do have another element of tactile sensation as one can touch the string and feel the knots. Mirra’s imprints reminds me of my first tests on site without success as I tried to lay down wet papers on the ground to get an imprint. Her imprints also highlight the bodily experience of bending while taken the imprints. Here I can see how the moment is captured as a refection on time. Another approach is taken by Roni Horn who explores in-depth the materiality. He applies a sequential approach with pigment and varnish on paper, the forms are rather formations (‘Must 21‘ 1985). She explores with scrutiny the qualities of the material. The approach to landscape and environment through exploration of materiality is also a theme by Glen Onwin and Ian Davenport in a different sense with more focus on exploration of physical phenomena that impacts formations (gravity by Davenport, salt crystallisation by Onwin). Onwin applies at times juxtapositions of moments or time-elapse installations to visualize real time phenomena. I am fascinated by the materiality of mud and how I could use this in my project. Looking again at Richard Long I found that he made mud drawing by dipping only side of a paper in wet mud and than turning around so that the liquid water running down and leaving traces of solid mud behind. On display he than turns the around again so that the mud runs are going bottom up (‘River Avon Mud drawings‘, 1988 – a series of 10). He also published a book made from cut down pages of dipped-mud-water runs. them I will see to repeat his works and see how I can incorporate into my project. A deeper exploration of site and materiality of environment are approached by Rolf Iseli (‘Überlagerungen (superimpositions)‘, 2007) through his collection of earth from site that he embedded and visualised through abstraction. Another approach is done by the Boyle Family who are isolating and capturing (casts) mundane parts of the world around us in a random choice that enforce the viewer to look closer (‘Sand, Wind and Tide series‘, 1969). Anselm Kiefer ( ‘Nuremberg‘, 1982) is fusing materials at times in a contradictive way towards the subject to create a meaningful narrative. Kiefer uses found materials to transform them. Materiality can be explored also through a combination of an additive and subtractive process that can visualise time-elapse (Callum Innes, oil paint and turp in sequence, ‘Exposed Painting Dioxiane Violet‘, 2015). What I am looking now into is how to express and visualise convincingly and meaningful tactile, auditory and visual sensations. According to Merleau-Ponty do we encounter the world with our full body in one part, not by separate senses (in: Seamon, 2010). Pallasmaa who explored Merleau-Ponty’s phenomenology in architecture argues that the task of architecture is “to make visible how the world touches us” (in: Seamon, 2010) I find this phrase so intriguing to drawing that this would captures quite well my intention with my personal project. From my exhibition visit to ‘Prière de toucher‘ I understand that tactile sensations can be experienced through direct contact (like blind people are touching their environment) or through stimulation of skin (heat), memory (pain, arousal), or meaning (allegories). It can be visualised through narratives (allegories, videos) or through 3D installations where the viewer can be more involved, engaged. This leads me to the meaning of ‘blind‘ through a ‘desperate‘ engagement with material and surface to approximate the experiences of the world intrinsically would include the senses (see Gerard Richter’s abstract paintings – ‘Abstract Painting‘, 2005). I already applied this blind approach literally in the preparation phase of my project (click here) where I approaches tactile sensations in three steps: blind (touch only) looking at my drawing looking in a mirror. Another aspect that I find intriguing as it disconnects the work from human intervention is chance and a random selection (Boyle Family) or a random selection and distribution of media (Callum Innes, Gerhard Richter) or by relying on physical phenomena (Ian Davenport, Richard Long). But at the end there is the intention of the artist to create something meaningful and convincing. Installations: Could this be a more engaging way to visualise phenomena in time and in space (walking, visual survey, embodied experience). 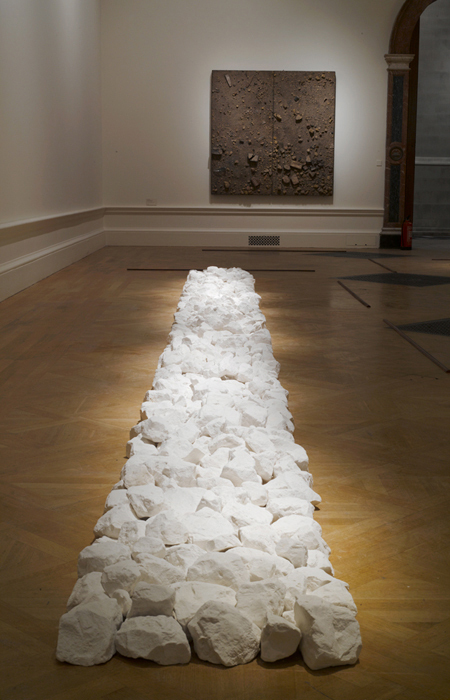 Glen Onwin (salt crystallisation) and Richard Long (‘Wall Works’, Walking pathways made out of stones) used installations for different purposes. => A combined approach/view of ‘walking‘, ‘environment‘, and ‘time‘ with found materials and reduced to the essence of each concept. Here I can see that it not only triggers visual perception but also tactile and re-called sensations linked to the experiences of the viewer. They may be even eager to ‘touch’. Drawing as an performative act: a video take (or in real life) can add a process dimension that engages the viewer in a way of that they are curious to see how a work evolves (Richard Long). This is a time-based seeing. Investigate process and materiality (medium, environment). Walking is drawing a path. Walking outside is making a path in a natural landscape. Walking with my feet leaves traces on the ground. I also pick up debris or dirt from the ground. My walking path is dictated either by a chosen itinerary or by a random movement triggered by sensations and visual point of interests. My walking path alongs the river Aare in Bern, Switzerland is inspired by the at times mystic atmosphere at the pebbled beach at the river. Old trees, dead wood, natural sculptures are mixed with stone formations done by human presence. My whole body is getting absorbed by the environment, I can touch with my feet and with my finger the ground, the pebbles. I can smell the water of the river and the mud between the pebbles and along the river. I can hear my feet walking and the noise around me. The still images (above) is one way of indexing my walking. The video recording is the time elapse process of my experience. Next step. visualising my path, looking the video and following it with charcoal stick. => I glued the photos with with acrylic adhesive, partly tapping with my spoiled fingers onto it. After a day I noticed that the photos and the colors were deteriorated with quite interesting visual effects. Something I will keep in mind for future. => Are those marks clear? They are not a real indexing, rather illustrating my ideas based on other works (Helen Mirra, Francis Alÿs). Do they draw upon my embodied experience? Partly, they do reflect on my walking but do not include my sensations experience. They do visualise a times based experience though. Do the markings, composition and format present a coherent drawing? As my walking path was a kid of linear and stretched I believe a vertical format is appropriate, The markings fill the paper in such a way as to indicate a close process. I am not sure whether this is coherent with my subject matter as my memories and the site as such do reach beyond limits. What would mean a delineation? I believe that framing a subject versus crossing edges gives a less ambiguous picture and leaves less space for exploration to the viewer. The environment is the reason for my walking sensational experience. It gives the space and material that I build on. The environment triggered memories, thoughts, and inspires to play. A notion of chaos is merely the result of a spatial-temporal process. The visible surface of the path and objects around me are the foundation that I can draw on and from. My sensational experience outside is part of a whole body experience. => Besides a nice perception what can this bring to my subject matter? How can I use imprints meaningful? => Do these works provide enough site experience by exploring territory? My drawings (or are they rather paintings?) do explore the space of the support as I did explore the space on site. The use of found materials do make a connection to site. The back and force of my hand with a wide spatula crossing the barriers of the little stones leaving traces, markings that do reflect the process of drawing as well build on the process of landscape formation. A back and force movement of natural forces (water, wind, pressure) in space and time. The drawing process builds on my bodily experience through my bodily engagement with the surface. => I could possibly add stronger site perception by adding further visual elements (abstraction) e.g. pebbles and delineation of water front (as in some works of my assignment). Using imprints for more believable markings that triggers sensations. Push further my physical exploration of space by applying positive and negative technique (see Callum Innes ‘un-painting’ approach). I explored with my site walking and discovery of materials by collecting mud, tiny particles and pebbles not only space but also time. The formation of such materials took time and will take time for re-formation. Individual stones are used to build up pyramids or circles through human presence (a process of play and a process of structuring). The same way nature with its own forces forms and build new structures e.g. pebbles with its unique shapes and textures. There is a flowing element of water and mud (a combination of water and sediments). Understanding those materials means also to understand site experience in a different approach. Building on process driven approaches by Ian Davenport, Callum Innes and Robert Long I am studying the physical characteristics of mud. I do use mud as it is closer to standard drawing media (pigments). => The running streams are random, controlled only by gravity, following stream follow the initial path. This reminds me of humans who mostly follow the same path walked by other before. If there is no path than a visible path will be formed over time by humans. Is it chance or an embodied experience, i.e. environment, that dictates the path? With more flow running down mud reconciles. A solidification is the effect of acrylic binder – resembles the formation of stones in nature over time under pressure (here: gravity). In the last of the four I put my fingers in the lower wet muddy area, leaving markings, an experience of touch. What if I would do this at larger scale with my feet instead of my fingers? Building on this I decided to make a larger scale work following my path of experiments. To build on my tactile sensation, the spatial dimension of site, and ‘walking’ in a wider sense I decided to work on two dimensions: wall and floor. I will stand on the paper on the floor to mark my movement while making the ‘mud runs’. This will also reflect by itself on my walking on site. I used now a paint container with a nib to have more control on the ‘mud runs’. In a second step I continued with ‘chalk runs’ (suspension made out of chalk powder and acrylic binder) to add another dimension in memory of the white ‘calcite markings’ on some pebbles. => Does the work conveys a sense of site experience? Yes, it builds on materials and my walking process on site. It also builds on the process of formation (sediment on the river beach, re-structuring out of random application). Through my stepping on the support and leaving markings, I do cross the space between studio drawing and site walk. I do believe this approach allows for a stronger emotional and conceptual link. The drawing was a physical demanding act as I had to look up and down – quite similar as I did at my site walking. This drawing is a process and time based as well as a performative approach. The chosen format enforces the natural flow of ‘mud runs’ by gravity. I do think that I used too much material as the floor areas is too ‘loaded’, my footprints not quite visible. Is the two steps approach (1. mud, 2. chalk) stronger than just mud? It is the combination that allows the resulting markings on the lower part. And it the combination of both that forms unique and visible structures. The next step would be to unfold the wall and floor part and to hang it completely on a wall (to enforce ambiguity). Another option would be to keep it folded as it is to have a similar experience to the viewer (but perhaps too obvious?). => I do need to consider whether the incorporation of more found materials on the floor part will give a stronger meaning or not. Also whether more steps layers (besides mud and chalk) would add to the drawing something stronger. I could envision to use less material or to enforce my ‘feet markings’ through a charcoal suspension that leaves more visible traces (perhaps after the first layer is dry or semi-dry). Kind of imprints as done above. Throughout my project I was eager to understand whether there would be a 3D presentation of my subject without being too obvious. I was happy to found through my recording approach and understanding the performative aspect of those (see Richard Long) that the drawing space can already be a 3D space (see Michael Croft and my work in ‘materiality and process‘ above). Besides this I was thinking how to actually embed real pebbles in one work. The small particles I could successfully incorporate in my works ‘materiality and surface‘ and materiality and process’ – but noticing the limits of drawing in 2D. I therefore looked from another perspective how I could draw upon this ideas and took reference to Sarah Woodfine’s drawn ‘cabinets’ (ex ‘Newfoundland‘, 2005). I wanted to bring it together with elements of movement, building on striations and delineation. Another aspect of movement and water (waves) brought me to the experience of moving pebbles under water that makes a sound (see: recording ‘The sound of Aare’, 2003 – click here). => I am not following this further at this time respecting my ‘drawing approach’. Perhaps this is still quite illustrative and not quite resolved. However I do think it can add a new perspective to drawing that I want to keep in mind for the future. Elaborate ‘materiality and surface‘ board drawings. More physical interaction with the board, using positive and negative approach. Enforce markings (imprints?). Repeat ‘materiality and process‘ work. Enforce markings (imprints?). Explore further space and markings linked to site experience.